The Apple iPad, despite its relatively short shelf-life has already gained its own dedicated fans. 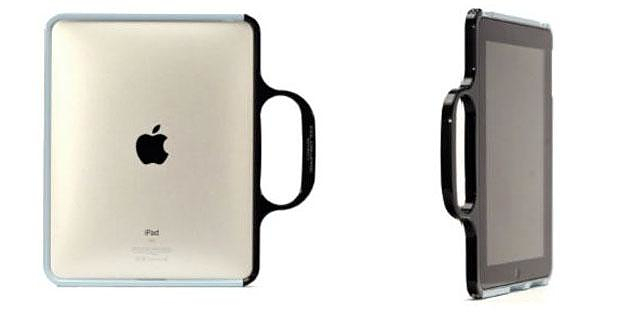 As a Netbook substitute and a platform of electronic reading, your new iPad will undoubtedly need a carrying case. The Grip for iPad case by Colorware certainly is one of the most stylish ways of carrying your iPad around, as it turns the iPad into a digital briefcase. It is a two-piece aluminum structure, made up of the handle and the frame that are firmly held together. It is made of is made from aircraft-grade aluminum and can be colored to your liking. There is a wide choice of finishes and colors for maximum customization and uniqueness. In the online Colorware store, you can design online your own “Grip for iPad” with glossy or matte texture, metal or normal finish and unlimited colors of your preference. The Grip has a flawless fit as it has been crafted with millimeter-precision, and the built-in handle will provide some pie of mind when carrying the fragile tablet outdoors. Our favorite part of the concept is the visual reference to the classic briefcase, a clear sign of paper converting into digital files. The only downside is the cost of Grip, at $300 it costs 50 percent the cost of a new iPad. However style and uniqueness come at a price, so if you want one better hurry, as Colorware is already taking orders and they need 3-4 weeks to build and ship a fully customized case.